In a very handy location close to the entrance to Quinta do Lago and in a quiet spot off the road to Vale do Lobo, this villa is built on a very large plot of 10000 m2 (2.5 acres). It has an enormous garden with extensive lawns (perfect for children to play on) to the back of the house and around the pool area. Restaurants, bars and shops at Quinta Shopping are approx. 1 km away, and Vale do Lobo is about 2km in the other direction. The beach is approximately 4km away. The living area is furnished with plenty of comfortable seating around a wood burning fireplace, TV with free to view satellite channels and DVD player. There is also a docking station for your I-Pod. The dining area has seating for 6 people with additional seating at the breakfast bar in the kitchen area. Master bedroom – this is located at the end of the hallway and can be set up as a twin or double room. There is a TV with free to view satellite channels and en suite shower room. Large patio doors open out to a covered terrace and views of the beautiful garden. Bedroom 3 is a twin room with a window out to the side of the property and en suite shower room. This private 10,000 square meter plot is fully enclosed and landscaped beautifully, offering plenty of space for children to play, and parents to relax. 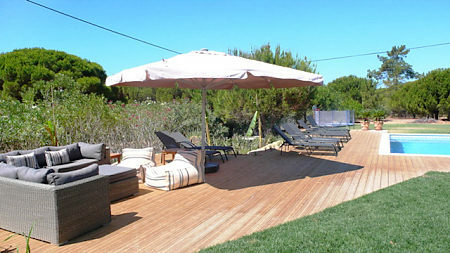 Mature palm and pine trees offer shade to escape from the hotel Algarve sunshine. The newly built Barbecue area has a large gas barbecue, sink area and extra fridge. The enormous table will comfortably seat all your party and adjacent large covered terrace is furnished with lots of comfortable seating for relaxing and reading a book or enjoying a glass of Portuguese wine.